I feel a little stupid. It turns out that I did manage to capture Comet Pan Starrs after all. After going back and studying a few of the frames I took near the end of last weeks Tuesday night vigil, I saw something. On any of the exposures 1 second in length or longer, there it was! I never saw it with the naked eye, but my Sigmas 72mm diameter (approx.) 200mm focal length lens apparently captured enough light for success. It’s a good thing I wasn’t chewing gum a few minutes ago when I discovered this fact, I might have swallowed it. Oh yeah, that’s the comet there in the upper left. See it? Better late than never I guess. I got about 3 or 4 frames with the comet and my planned moon/windmill combo, but the composition is off, the comet is very weak, and they just don’t look good. The image above looks much better, it was one of the last I took while walking back to the car, not even knowing the comet was in there. Crazy times we live in. I had a plan last night. I had my location selected, with an interesting foreground object (windmill). 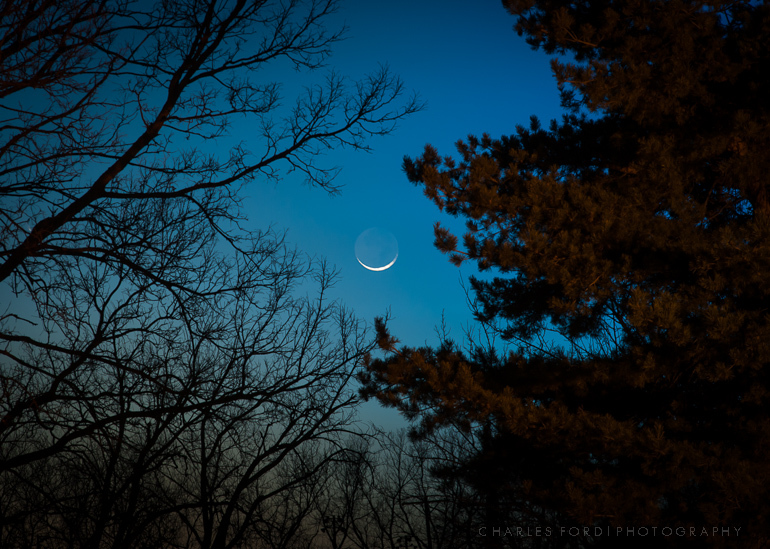 The previsualized shot would be windmill silhouette, comet Pan Starrs, and the almost new 1%-2% illuminated sliver of the moon, hanging there like a cosmic smiley face. It would have been glorious! Alas, although the moon became visible as expected, where expected, the comet did not. I was unable to see it, even with my small binoculars. I had noticed a high thin layer of hazy clouds as the light dimmed, I suspect those were the reason the comet was not visible. Even though the sky looks clear in these photos, I could see through the binoculars there was a high haze. I should also note that in my original camera position, the trees you see here were not obscuring my view. 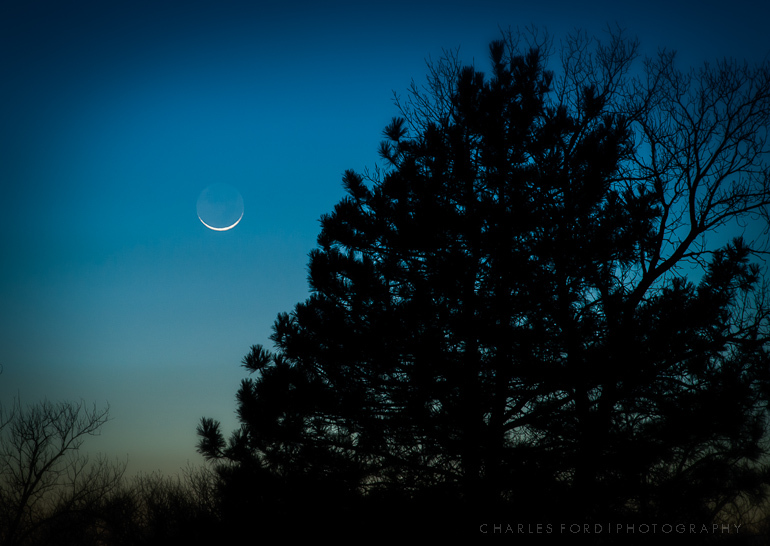 As I was walking back to my car, I noticed a fair amount of earthshine becoming visible on the moon, so grabbed a couple of moody shots of that. 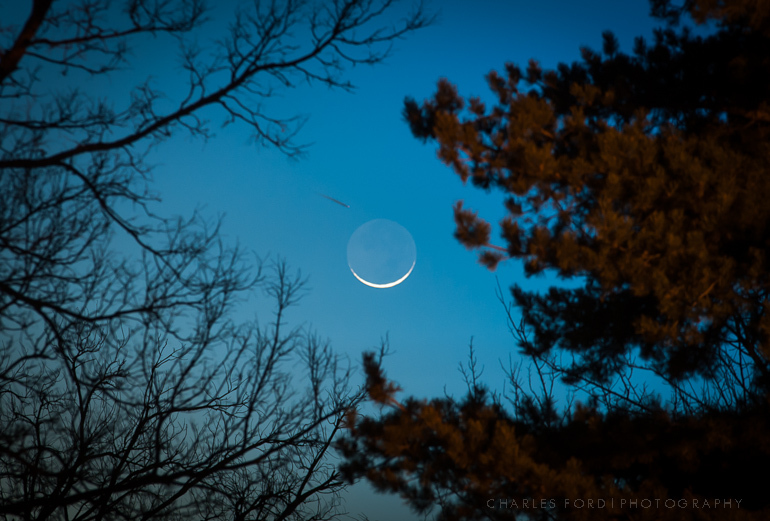 (Earthshine is sunlight reflected from the earth back to the night side of the moon. ) It was fun to be out shooting, even if the comet was a no show. Online this morning, I’ve seen several images similar to the one I envisioned, not everyone struck out last night. And finally, here’s a photo taken shortly after the first image posted. I cropped it tighter to show you….what is that streak near the moon? Could it be….is that the comet?! No, sorry, its just the contrail of a high flying jet aircraft. I thought about trying to pass it off as the comet but figured the astrophotography police would bust me for it right away. I’m thinking of trying for a comet shot again tonight or at least sometime this week. The windmill will still be there.